Seattle Pump and Equipment is Western Washington’s Exclusive Hotsy Dealer. No matter the job, Seattle Pump will work with you to find the right Hot Water Pressure Washer for your needs! Contact one of our sales experts to discuss the right cleaning solutions for your toughest tasks! The Gas Engine Series consist of the most compact and portable hot water pressure washers on the market. Powered by reliable gasoline engines, all you need is water and you can clean anywhere anytime. All Hotsy units are backed by Hotsy’s 7-year pump warranty and all are ETL safety certified. The Belt-Drive Gas Engine Series Hot Water Pressure Washers are available in 9, 13 or 16 HP; two of the models are powered by Honda, while a third features a Robin Subaru, and a fourth a Vanguard engine. This series is the most versatile in the Hotsy hot water pressure washer line up for mobility options. The chassis is available with different wheel kits, as well as trailer mount or skid varieties for easy portability. The belt-drive gas engine offers cleaning power up to 4.6 GPM at 3500 PSI with the Hotsy triplex pump, carrying a 7-year warranty. All models are ETL safety certified. The Super Skid HSS Series is by far, the largest, most powerful of Hotsy’s hot water pressure washers. The Super-Duty HSDS models feature a Hawk pump with lower RPM for long-lasting durability; there’s literally nothing else on the market as robust, big & powerful. HSS models come standard with the reliable Hotsy triplex belt-driven high-pressure pump. Triple banded belt for more efficient power transmission. Models are powered by a 16 & 24 HP Kubota engines with electric start and all feature a 3/4-inch foil-backed insulated Schedule 80 heating coil with stainless steel skin and 5-year warranty. Two fuel tanks for longer operation, a high-efficiency Wayne burner and optional dual-gun kit allows two users at one time. The Hotsy Trail Blazer consists of a single axle pressure washer trailer mounted with a Hotsy hot water pressure washer. A large water tank on board with the pressure washer trailer means you can clean on site with ease. Construction sites, around the farm or ranch, or for contract cleaning, the Hotsy pressure washer trailer provides the ability to clean anything, anywhere. Our portable power washers have many features, yet provides businesses with an economical way to clean on the go. The 700 Series offers a nice balance of Hotsy ruggedness and cleaning performance, yet the affordability of an entry-level machine. In addition to the three direct-drive models, this series also offers a belt-drive model that cleans at 3.5 GPM and 3000 PSI. The multiple fuel and electrical options makes the 700 series ideal for meeting the needs of commercial customers. All models are ETL safety certified and feature the Hotsy pump with a 7-year warranty. 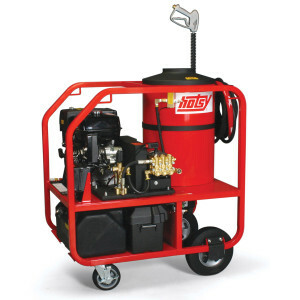 The Hotsy 800 Series is a mobile pressure washer powered by an electric motor, using heating oil to heat the burner. This series is powered by the Hotsy belt drive triplex pump. the 800 Series is designed with 12” rubber tires and beefy casters, which makes it easier to move than other heavy-duty mobile models. Uses the reliable Hotsy Crossfire burner, and comes with Hotsy’s industry leading warranties. Hotsy’s flagship stationary model is packed with features, the most impressive being the programmable smart control automation for auto start/stop and time delay shutdown can be set to meet your individual needs. The core components of the 900 Series washer are protected beneath removable panels, which help protect from overspray and dust. Side panels are easily removed for access for service and maintenance. Hotsy’s 1400 Series stationary model is a powerful electric powered washer packed with features, the most impressive being the programmable smart control automation for auto start/stop and time delay shutdown can be set to meet your individual needs. The core components of the 1400 Series washer are protected beneath removable panels, which help protect from overspray and dust. Side panels are easily removed for service access and maintenance. Meet the flagship of the Hotsy Hot Water Pressure Washer line – the 5700 / 5800 Series. This stationary heavy-duty series is ideal for wash bay installations, and is powerful enough for dual-gun operation. With its 15 HP Baldor motor driving the Hotsy Pump, backed by a 7-year warranty, the 5700 Series delivers cleaning power of up to 9.5 GPM and 3000 PSI. The 5700 / 5800 Series can be outfitted to heat with oil, natural gas or liquid propane. All models are certified to the rigid UL-1776 safety standards.